Who would have believed that in the digital age rabbit ears & TV antennas – absolute relics in the high-tech world – would be making a comeback. Strangely enough it is because of the digital age that these relics of days gone by are making a comeback. More and more TV viewers are tuning into online-video programming. So why then continue to be ripped off by the cable companies who charge way too much for what they offer – 100s of channels and nothing to watch? If you’re embracing online-video programming, get rid of cable, put up an antenna and dust off those old rabbit ears. Are consumers “getting with the program”? You bet they are. Antenna sales are through the roof, or should it be on the roof. Wal-Mart, Best Buy and Costco are now selling antennas. How much money can you save? The average antenna costs between $50 and $150. The average consumer cable bill is $91.44/month without the bells and whistles like premium channels and high definition. The savings are staggering. It just goes to prove that the more things change, the more they stay the same. Co-author of "The Last Original Idea" Alan K'necht will once again take the stage when he delivers the opening keynote address at Socialize Monetizing Social Media in Toronto on January 27, 2012. The theme of his address will be "Past, Present and Future: Measuring Social Media’s Impact". Rest assured that in his address Alan will be taking attendees on an entertaining ride through the history of social media/marketing and he'll even attempt to measure it. As part of his speaking agreement with the conference organizers, 100 copies of our book "The Last Original Idea" will be given away at the event. For more information on this event and to register please visit http://www.mediabistro.com/socialize/ We are also happy to offer a discount code for 15% off the registration price. Simply use the code “SOCSPKR” when registering. While at the event be sure to say hi to Alan and he'll be happy to sign your copy of the book. Co-author, Geri Rockstein, will be attending the event, so say hi to her and she'll also be thrilled to sign your copy of the book as well. Alan is off to his fourth conference in 3.5 weeks to spread the word of how to measure social media & to promote "The Last Original Idea - A Cynic's View of Internet Marketing". His vision & concepts have taken him from San Francisco (Socialize West) to Dublin, Ireland (DCU When Search & Social Collide where every attendee was presented with a copy of the book), to an online presentation (where one participant won a signed copy) and today to PubCon in Las Vegas where he'll be sharing his wisdom this Thursday (Nov 10, 2011) plus 50 copies will be giving away during an after hours event (The Epic Dinner) and he'll be holding a book signing on Thursday afternoon. Social Media is a tool and what we need to measure is the success of "Social Marketing"! So stop grouping all the tools into one bundle. To be successful you need to measure the importance and success of each tool in your social marketing tool box. 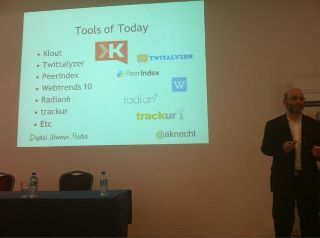 Don't use scoring tools (Klout, PeerIndex, Twitalyzer, etc.) to compare your score to anyone else. They measure how well you are doing in achieving your goals using the the different collection of tools that they attempt to score. People have been social since the days of the cavemen, and methods of measurement started not much after that. So stop trying to reinvent method and take a look back and apply those time tested methods to your new tools. Think of how a hammer looked a hundred years ago, a 1,000 years ago and 5,000 years ago. What a hammer is made of and the look has changed, but the goal hasn't "drive a nail into a piece of wood". This analogy is how everyone needs to look at their set of social marketing tool kit (social media), define the goal and objectives and then measure how many nails you have successful driven in using them. Alan is always happy to speak to groups of a variety of size. Arrange to have Alan give an address your next event contact us. The next major speaking event on Alan's agenda is the opening Keynote at Socialize: Monetizing Social Media Toronto January 26-27 2012. Has Branding Really Come a Long Way? We perceive Brand Management as a modern concept, but how much do you really know about branding? This great, modern concept actually began in 1931; yes I said 1931! No, it wasn’t borne in the advertising Mecca of Madison Avenue, but in Cincinnati at the headquarters of Procter & Gamble. Brand Management was in essence the brainchild of Neil McElroy, a 27-year old advertising executive assigned to the Camay Soap brand. He needed to hire two more people in his department and to make a case for the new hires he wrote a ground breaking memo (commonly referred to as the “Brand Man Memo”). McElroy did get his two hires, but more importantly this memo was so powerful that Proctor & Gamble changed how it managed its brands. This was quite an impressive feat when you consider that Proctor & Gamble was hardly a struggling new kid on the block. Au contraire, P & G was almost 100 years old at the time and it was nothing short of a miracle that they embraced change. It’s remarkable when you consider that 80 years has passed. We like to think of ourselves as great innovators, but are we really just arrogantly repackaging old ideas and repurposing them, hoping that no one will notice? In case you missed Alan today, you have another chance to catch him live on Friday, April 29 at the Search Marketing Expo taking place at the Sheraton Centre Hotel in downtown Toronto, conveniently located at 123 Queen Street West. Alan will be part of a panel addressing important issues related to Search Analytics in the Civic Ballroom South from 11:00 AM - Noon. Don't miss this great panel discussion and come with your questions. Once you’ve defined your KPI, there are hundreds of other data points that may be impacting your key results. In this session, experts take the audience deep into the process of segmenting data and isolating metrics to gain greater insight, take action and improve search marketing ROI. When Gutenberg invented the printing press (1436-1440) one can only imagine what was going through his mind. Most believe that his goal was(beyond making money)to bring down the cost of producing books, making them affordable for the masses and yes, to help increase the distribution of the Bible (the Gutenberg Bible). It's hard to believe that he could foresee the consequences of this invention. Firstly reading, once the exclusive domain of nobility and the clergy, was now available to the common man. As the knowledge of how to operate a printing press spread and the price of the equipment declined it led to another evolution - the ability of a handful of people to rapidly print messages for mass distribution and consumption. The deployment of this tactic is well documented in helping spur on and influence the French Revolution 300 years after the introduction of movable type by Gutenberg. As Internet technologies evolved Sir Tim Berners-Lee had similar goals to Gutenberg when he invented the World Wide Web. In essence it took publishing out of the hands of the few and put it in the hands of the many. Yet it wasn't until the wide adoption of Twitter around the world that we can truly see history repeating itself. Twitter as a technology allows anyone to post a message of 140 characters and have it distributed to the world in a matter of seconds. You don't have to be a friend or fan as in Facebook. You don't have to monitor a website for details; you just need to follow a person or a hash tag or monitor it for a specific phrase. With this power available to so many, no wonder countries faced with uprisings and revolution are now trying to shut down Internet access in its entirety and not just block specific websites. Yet the powerful backbone of the Internet TCP/IP as we saw in Egypt earlier this month allows applications like Twitter to function beyond the confines of political borders and actually accelerate the speed of the revolution as the printed word did for the French Revolution. 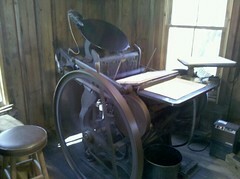 So is Twitter the reincarnation of Gutenberg's printing press? Perhaps not the technology or the application of it, but most certainly its use. Ultimately the use of the printed word to stimulate and spread the word of revolution isn't an original idea, but modern technology like Twitter can make revolutions happen faster.